Mary Webb was born Mary Gladys Meredith at Leighton Lodge on 25th March 1881 (Lady Day). The Lodge in the grounds of Leighton Hall is a substantial red brick house now in private ownership. It was here that her father George Edward Meredith, an Oxford M.A. had a small boarding school preparing boys for entrance to public schools. 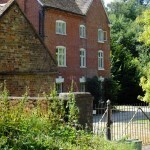 The family lived here until 1882 when they moved to The Grange at Much Wenlock. If you will go out on some June morning, before the earliest bee comes droning by, when the stripes of sunlight lie right across the awakening earth, you will know the fascination of shadows.